Lahore, University of Health Sciences Lahore has started the admission process for the MBBS class and BDS class. UHS Lahore conducts the MDCAT test of the eligible candidates, who want to get admission in the medical and dental colleges in the MBBS and BDS classes and they can send their application forms or get registered online for the MDCAT test 2017 from 10 July to 28 July 2017. 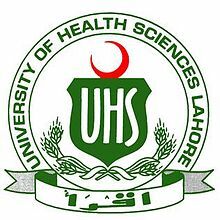 UHS will conduct the medical college admission test 2017 on the behalf of government of Punjab on 20 August 2017 for grant of admissions in the medical and dental programs. The candidates can deposit their admission fee for MDCAT test 2017, the collection services are provided at the counters of Bank Islamic (Private) Limited branches all over Pakistan from 10 July to 28 July 2017.